"TV" redirects here. For other uses, see Television (disambiguation) and TV (disambiguation). A television, commonly referred to as TV, telly or the tube, also called idiot box, is a telecommunication medium used for transmitting sound with moving images in monochrome (black-and-white), or in colour, and in two or three dimensions. It can refer to a television set, a television program, or the medium of television transmission. Television is a mass medium, for entertainment, education, news and advertising. In 2013, 79% of the world's households owned a television set. The replacement of early bulky, high-voltage cathode ray tube (CRT) screen displays with compact, energy-efficient, flat-panel alternative technologies such as plasma displays, LCDs (both fluorescent-backlit and LED), and OLED displays was a hardware revolution that began with computer monitors in the late 1990s. Most TV sets sold in the 2000s were flat-panel, mainly LEDs. Major manufacturers announced the discontinuation of CRT, DLP, plasma, and even fluorescent-backlit LCDs by the mid-2010s. LEDs are expected to be replaced gradually by OLEDs in the near future. Also, major manufacturers have announced that they will increasingly produce smart TV sets in the mid-2010s. Smart TVs with integrated Internet and Web 2.0 functions became the dominant form of television by the late 2010s. The word television comes from Ancient Greek τῆλε (tèle), meaning "far", and Latin visio, meaning "sight". The slang term "telly" is more common in the UK. The slang term "the tube" refers to the bulky cathode ray tube used on most TVs until the advent of flat-screen TVs. Facsimile transmission systems for still photographs pioneered methods of mechanical scanning of images in early 19th century. Alexander Bain introduced the facsimile machine between 1843 and 1846. Frederick Bakewell demonstrated a working laboratory version in 1851. Willoughby Smith discovered the photoconductivity of the element selenium in 1873. As a 23-year-old German university student, Paul Julius Gottlieb Nipkow proposed and patented the Nipkow disk in 1884. This was a spinning disk with a spiral pattern of holes in it, so each hole scanned a line of the image. Although he never built a working model of the system, variations of Nipkow's spinning-disk "image rasterizer" became exceedingly common. Constantin Perskyi had coined the word television in a paper read to the International Electricity Congress at the International World Fair in Paris on 25 August 1900. Perskyi's paper reviewed the existing electromechanical technologies, mentioning the work of Nipkow and others. However, it was not until 1907 that developments in amplification tube technology by Lee de Forest and Arthur Korn, among others, made the design practical. By the 1920s, when amplification made television practical, Scottish inventor John Logie Baird employed the Nipkow disk in his prototype video systems. On 25 March 1925, Baird gave the first public demonstration of televised silhouette images in motion, at Selfridge's Department Store in London. Since human faces had inadequate contrast to show up on his primitive system, he televised a ventriloquist's dummy named "Stooky Bill" talking and moving, whose painted face had higher contrast. By 26 January 1926 he demonstrated the transmission of the image of a face in motion by radio. This is widely regarded as the first television demonstration. The subject was Baird's business partner Oliver Hutchinson. Baird's system used the Nipkow disk for both scanning the image and displaying it. A bright light shining through a spinning Nipkow disk set with lenses projected a bright spot of light which swept across the subject. Selenium photoelectric tube detected the light reflected from the subject and converted it into a proportional electrical signal. This was transmitted by AM radio waves to a receiver unit, where the video signal was applied to a neon light behind a second Nipkow disk rotating synchronized with the first. The brightness of the neon lamp was varied in proportion to the brightness of each spot on the image. As each hole in the disk passed by, one scan line of the image was reproduced. Baird's disk had 30 holes, producing an image with only 30 scan lines, just enough to recognize a human face. In 1927, Baird transmitted a signal over 438 miles (705 km) of telephone line between London and Glasgow. In 1928, Baird's company (Baird Television Development Company/Cinema Television) broadcast the first transatlantic television signal, between London and New York, and the first shore-to-ship transmission. In 1929, he became involved in the first experimental mechanical television service in Germany. In November of the same year, Baird and Bernard Natan of Pathé established France's first television company, Télévision-Baird-Natan. In 1931, he made the first outdoor remote broadcast, of the Epsom Derby. In 1932, he demonstrated ultra-short wave television. Baird's mechanical system reached a peak of 240-lines of resolution on BBC television broadcasts in 1936 though the mechanical system did not scan the televised scene directly. Instead a 17.5mm film was shot, rapidly developed and then scanned while the film was still wet. An American inventor, Charles Francis Jenkins, also pioneered the television. He published an article on "Motion Pictures by Wireless" in 1913, but it was not until 1923 that he transmitted moving silhouette images for witnesses; and it was on 13 June 1925 that he publicly demonstrated synchronized transmission of silhouette pictures. In 1925 Jenkins used the Nipkow disk and transmitted the silhouette image of a toy windmill in motion, over a distance of five miles, from a naval radio station in Maryland to his laboratory in Washington, D.C., using a lensed disk scanner with a 48-line resolution. He was granted the U.S. patent No. 1,544,156 (Transmitting Pictures over Wireless) on 30 June 1925 (filed 13 March 1922). Herbert E. Ives and Frank Gray of Bell Telephone Laboratories gave a dramatic demonstration of mechanical television on 7 April 1927. Their reflected-light television system included both small and large viewing screens. The small receiver had a 2-inch-wide by 2.5-inch-high screen. The large receiver had a screen 24 inches wide by 30 inches high. Both sets were capable of reproducing reasonably accurate, monochromatic moving images. Along with the pictures, the sets received synchronized sound. The system transmitted images over two paths: first, a copper wire link from Washington to New York City, then a radio link from Whippany, New Jersey. Comparing the two transmission methods, viewers noted no difference in quality. Subjects of the telecast included Secretary of Commerce Herbert Hoover. A flying-spot scanner beam illuminated these subjects. The scanner that produced the beam had a 50-aperture disk. The disc revolved at a rate of 18 frames per second, capturing one frame about every 56 milliseconds. (Today's systems typically transmit 30 or 60 frames per second, or one frame every 33.3 or 16.7 milliseconds respectively.) Television historian Albert Abramson underscored the significance of the Bell Labs demonstration: "It was in fact the best demonstration of a mechanical television system ever made to this time. It would be several years before any other system could even begin to compare with it in picture quality." In 1928, WRGB then W2XB was started as world's first television station. It broadcast from the General Electric facility in Schenectady, NY. It was popularly known as "WGY Television". Meanwhile, in the Soviet Union, Léon Theremin had been developing a mirror drum-based television, starting with 16 lines resolution in 1925, then 32 lines and eventually 64 using interlacing in 1926, and as part of his thesis on 7 May 1926 he electrically transmitted and then projected near-simultaneous moving images on a five-foot square screen. By 1927 he achieved an image of 100 lines, a resolution that was not surpassed until 1931 by RCA, with 120 lines. On 25 December 1926, Kenjiro Takayanagi demonstrated a television system with a 40-line resolution that employed a Nipkow disk scanner and CRT display at Hamamatsu Industrial High School in Japan. This prototype is still on display at the Takayanagi Memorial Museum in Shizuoka University, Hamamatsu Campus. His research in creating a production model was halted by the US after Japan lost World War II. The advancement of all-electronic television (including image dissectors and other camera tubes and cathode ray tubes for the reproducer) marked the beginning of the end for mechanical systems as the dominant form of television. Mechanical television, despite its inferior image quality and generally smaller picture, would remain the primary television technology until the 1930s. The last mechanical television broadcasts ended in 1939 at stations run by a handful of public universities in the United States. In 1897, English physicist J. J. Thomson was able, in his three famous experiments, to deflect cathode rays, a fundamental function of the modern cathode ray tube (CRT). The earliest version of the CRT was invented by the German physicist Ferdinand Braun in 1897 and is also known as the Braun tube. It was a cold-cathode diode, a modification of the Crookes tube with a phosphor-coated screen. In 1907, Russian scientist Boris Rosing used a CRT in the receiving end of an experimental video signal to form a picture. He managed to display simple geometric shapes onto the screen, which marked the first time that CRT technology was used for what is now known as television. In 1908 Alan Archibald Campbell-Swinton, fellow of the Royal Society (UK), published a letter in the scientific journal Nature in which he described how "distant electric vision" could be achieved by using a cathode ray tube, or Braun tube, as both a transmitting and receiving device, He expanded on his vision in a speech given in London in 1911 and reported in The Times and the Journal of the Röntgen Society. In a letter to Nature published in October 1926, Campbell-Swinton also announced the results of some "not very successful experiments" he had conducted with G. M. Minchin and J. C. M. Stanton. They had attempted to generate an electrical signal by projecting an image onto a selenium-coated metal plate that was simultaneously scanned by a cathode ray beam. These experiments were conducted before March 1914, when Minchin died, but they were later repeated by two different teams in 1937, by H. Miller and J. W. Strange from EMI, and by H. Iams and A. Rose from RCA. Both teams succeeded in transmitting "very faint" images with the original Campbell-Swinton's selenium-coated plate. Although others had experimented with using a cathode ray tube as a receiver, the concept of using one as a transmitter was novel. The first cathode ray tube to use a hot cathode was developed by John B. Johnson (who gave his name to the term Johnson noise) and Harry Weiner Weinhart of Western Electric, and became a commercial product in 1922. In 1926, Hungarian engineer Kálmán Tihanyi designed a television system utilizing fully electronic scanning and display elements and employing the principle of "charge storage" within the scanning (or "camera") tube. The problem of low sensitivity to light resulting in low electrical output from transmitting or "camera" tubes would be solved with the introduction of charge-storage technology by Kálmán Tihanyi beginning in 1924. His solution was a camera tube that accumulated and stored electrical charges ("photoelectrons") within the tube throughout each scanning cycle. The device was first described in a patent application he filed in Hungary in March 1926 for a television system he dubbed "Radioskop". After further refinements included in a 1928 patent application, Tihanyi's patent was declared void in Great Britain in 1930, so he applied for patents in the United States. Although his breakthrough would be incorporated into the design of RCA's "iconoscope" in 1931, the U.S. patent for Tihanyi's transmitting tube would not be granted until May 1939. The patent for his receiving tube had been granted the previous October. Both patents had been purchased by RCA prior to their approval. Charge storage remains a basic principle in the design of imaging devices for television to the present day. On 25 December 1926, at Hamamatsu Industrial High School in Japan, Japanese inventor Kenjiro Takayanagi demonstrated a TV system with a 40-line resolution that employed a CRT display. This was the first working example of a fully electronic television receiver. Takayanagi did not apply for a patent. On 7 September 1927, American inventor Philo Farnsworth's image dissector camera tube transmitted its first image, a simple straight line, at his laboratory at 202 Green Street in San Francisco. By 3 September 1928, Farnsworth had developed the system sufficiently to hold a demonstration for the press. This is widely regarded as the first electronic television demonstration. In 1929, the system was further improved by the elimination of a motor generator, so that his television system now had no mechanical parts. That year, Farnsworth transmitted the first live human images with his system, including a three and a half-inch image of his wife Elma ("Pem") with her eyes closed (possibly due to the bright lighting required). Meanwhile, Vladimir Zworykin was also experimenting with the cathode ray tube to create and show images. While working for Westinghouse Electric in 1923, he began to develop an electronic camera tube. But in a 1925 demonstration, the image was dim, had low contrast and poor definition, and was stationary. Zworykin's imaging tube never got beyond the laboratory stage. But RCA, which acquired the Westinghouse patent, asserted that the patent for Farnsworth's 1927 image dissector was written so broadly that it would exclude any other electronic imaging device. Thus RCA, on the basis of Zworykin's 1923 patent application, filed a patent interference suit against Farnsworth. The U.S. Patent Office examiner disagreed in a 1935 decision, finding priority of invention for Farnsworth against Zworykin. Farnsworth claimed that Zworykin's 1923 system would be unable to produce an electrical image of the type to challenge his patent. Zworykin received a patent in 1928 for a color transmission version of his 1923 patent application, he also divided his original application in 1931. Zworykin was unable or unwilling to introduce evidence of a working model of his tube that was based on his 1923 patent application. 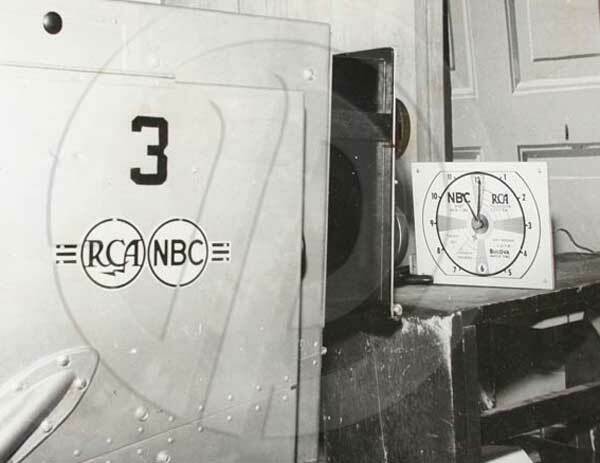 In September 1939, after losing an appeal in the courts, and determined to go forward with the commercial manufacturing of television equipment, RCA agreed to pay Farnsworth US$1 million over a ten-year period, in addition to license payments, to use his patents. In 1933, RCA introduced an improved camera tube that relied on Tihanyi's charge storage principle. Dubbed the Iconoscope by Zworykin, the new tube had a light sensitivity of about 75,000 lux, and thus was claimed to be much more sensitive than Farnsworth's image dissector. However, Farnsworth had overcome his power problems with his Image Dissector through the invention of a completely unique "multipactor" device that he began work on in 1930, and demonstrated in 1931. This small tube could amplify a signal reportedly to the 60th power or better and showed great promise in all fields of electronics. Unfortunately, a problem with the multipactor was that it wore out at an unsatisfactory rate. At the Berlin Radio Show in August 1931, Manfred von Ardenne gave a public demonstration of a television system using a CRT for both transmission and reception. However, Ardenne had not developed a camera tube, using the CRT instead as a flying-spot scanner to scan slides and film. Philo Farnsworth gave the world's first public demonstration of an all-electronic television system, using a live camera, at the Franklin Institute of Philadelphia on 25 August 1934, and for ten days afterwards. In Britain the EMI engineering team led by Isaac Shoenberg applied in 1932 for a patent for a new device they dubbed "the Emitron", which formed the heart of the cameras they designed for the BBC. On 2 November 1936, a 405-line broadcasting service employing the Emitron began at studios in Alexandra Palace, and transmitted from a specially built mast atop one of the Victorian building's towers. It alternated for a short time with Baird's mechanical system in adjoining studios, but was more reliable and visibly superior. This was the world's first regular "high-definition" television service. The original American iconoscope was noisy, had a high ratio of interference to signal, and ultimately gave disappointing results, especially when compared to the high definition mechanical scanning systems then becoming available. The EMI team under the supervision of Isaac Shoenberg analyzed how the iconoscope (or Emitron) produces an electronic signal and concluded that its real efficiency was only about 5% of the theoretical maximum. They solved this problem by developing and patenting in 1934 two new camera tubes dubbed super-Emitron and CPS Emitron. The super-Emitron was between ten and fifteen times more sensitive than the original Emitron and iconoscope tubes and, in some cases, this ratio was considerably greater. It was used for an outside broadcasting by the BBC, for the first time, on Armistice Day 1937, when the general public could watch on a television set as the King laid a wreath at the Cenotaph. This was the first time that anyone could broadcast a live street scene from cameras installed on the roof of neighboring buildings, because neither Farnsworth nor RCA could do the same before the 1939 New York World's Fair. American television broadcasting, at the time, consisted of a variety of markets in a wide range of sizes, each competing for programming and dominance with separate technology, until deals were made and standards agreed upon in 1941. RCA, for example, used only Iconoscopes in the New York area, but Farnsworth Image Dissectors in Philadelphia and San Francisco. In September 1939, RCA agreed to pay the Farnsworth Television and Radio Corporation royalties over the next ten years for access to Farnsworth's patents. With this historic agreement in place, RCA integrated much of what was best about the Farnsworth Technology into their systems. In 1941, the United States implemented 525-line television. The world's first 625-line television standard was designed in the Soviet Union in 1944, and became a national standard in 1946. The first broadcast in 625-line standard occurred in Moscow in 1948. The concept of 625 lines per frame was subsequently implemented in the European CCIR standard. Scottish inventor John Logie Baird demonstrated the world's first color transmission on 3 July 1928, using scanning discs at the transmitting and receiving ends with three spirals of apertures, each spiral with filters of a different primary color; and three light sources at the receiving end, with a commutator to alternate their illumination. Baird also made the world's first color broadcast on 4 February 1938, sending a mechanically scanned 120-line image from Baird's Crystal Palace studios to a projection screen at London's Dominion Theatre. The first practical hybrid system was again pioneered by John Logie Baird. In 1940 he publicly demonstrated a color television combining a traditional black-and-white display with a rotating colored disk. This device was very "deep", but was later improved with a mirror folding the light path into an entirely practical device resembling a large conventional console. However, Baird was not happy with the design, and as early as 1944 had commented to a British government committee that a fully electronic device would be better. As early as 1940, Baird had started work on a fully electronic system he called the "Telechrome". Early Telechrome devices used two electron guns aimed at either side of a phosphor plate. The phosphor was patterned so the electrons from the guns only fell on one side of the patterning or the other. Using cyan and magenta phosphors, a reasonable limited-color image could be obtained. He also demonstrated the same system using monochrome signals to produce a 3D image (called "stereoscopic" at the time). A demonstration on 16 August 1944 was the first example of a practical color television system. Work on the Telechrome continued and plans were made to introduce a three-gun version for full color. However, Baird's untimely death in 1946 ended development of the Telechrome system. Although all-electronic color was introduced in the U.S. in 1953, high prices and the scarcity of color programming greatly slowed its acceptance in the marketplace. The first national color broadcast (the 1954 Tournament of Roses Parade) occurred on 1 January 1954, but during the following ten years most network broadcasts, and nearly all local programming, continued to be in black-and-white. It was not until the mid-1960s that color sets started selling in large numbers, due in part to the color transition of 1965 in which it was announced that over half of all network prime-time programming would be broadcast in color that fall. The first all-color prime-time season came just one year later. In 1972, the last holdout among daytime network programs converted to color, resulting in the first completely all-color network season. Early color sets were either floor-standing console models or tabletop versions nearly as bulky and heavy; so in practice they remained firmly anchored in one place. The introduction of GE's relatively compact and lightweight Porta-Color set in the spring of 1966 made watching color television a more flexible and convenient proposition. In 1972, sales of color sets finally surpassed sales of black-and-white sets. Color broadcasting in Europe was not standardized on the PAL format until the 1960s, and broadcasts did not start until 1967. By this point many of the technical problems in the early sets had been worked out, and the spread of color sets in Europe was fairly rapid. By the mid-1970s, the only stations broadcasting in black-and-white were a few high-numbered UHF stations in small markets, and a handful of low-power repeater stations in even smaller markets such as vacation spots. By 1979, even the last of these had converted to color and by the early 1980s B&W sets had been pushed into niche markets, notably low-power uses, small portable sets, or for use as video monitor screens in lower-cost consumer equipment. By late 1980's even these areas switched to color sets. Digital television (DTV) is the transmission of audio and video by digitally processed and multiplexed signals, in contrast to the totally analog and channel separated signals used by analog television. Digital TV can support more than one program in the same channel bandwidth. It is an innovative service that represents the first significant evolution in television technology since color television in the 1950s. In the mid-1980s, as Japanese consumer electronics firms forged ahead with the development of HDTV technology, the MUSE analog format proposed by NHK, a Japanese company, was seen as a pacesetter that threatened to eclipse U.S. electronics companies. Until June 1990, the Japanese MUSE standard, based on an analog system, was the front-runner among the more than 23 different technical concepts under consideration. Then, an American company, General Instrument, demonstrated the feasibility of a digital television signal. This breakthrough was of such significance that the FCC was persuaded to delay its decision on an ATV standard until a digitally based standard could be developed. The final standards adopted by the FCC did not require a single standard for scanning formats, aspect ratios, or lines of resolution. This compromise resulted from a dispute between the consumer electronics industry (joined by some broadcasters) and the computer industry (joined by the film industry and some public interest groups) over which of the two scanning processes—interlaced or progressive—would be best suited for the newer digital HDTV compatible display devices. Interlaced scanning, which had been specifically designed for older analogue CRT display technologies, scans even-numbered lines first, then odd-numbered ones. In fact interlaced scanning can be looked at as the first video compression model as it was partly designed in the 1940s to double the image resolution to exceed the limitations of the television broadcast bandwidth. Another reason for its adoption was to limit the flickering on early CRT screens whose phosphor coated screens could only retain the image from the electron scanning gun for a relatively short duration. However interlaced scanning does not work as efficiently on newer display devices such as Liquid-crystal (LCD) for example which are better suited to a more frequent progressive refresh rate. Progressive scanning, the format that the computer industry had long adopted for computer display monitors, scans every line in sequence, from top to bottom. Progressive scanning in effect doubles the amount of data generated for every full screen displayed in comparison to interlaced scanning by painting the screen in one pass in 1/60 second, instead of two passes in 1/30 second. The computer industry argued that progressive scanning is superior because it does not "flicker" on the new standard of display devices in the manner of interlaced scanning. It also argued that progressive scanning enables easier connections with the Internet, and is more cheaply converted to interlaced formats than vice versa. The film industry also supported progressive scanning because it offers a more efficient means of converting filmed programming into digital formats. For their part, the consumer electronics industry and broadcasters argued that interlaced scanning was the only technology that could transmit the highest quality pictures then (and currently) feasible, i.e., 1,080 lines per picture and 1,920 pixels per line. Broadcasters also favored interlaced scanning because their vast archive of interlaced programming is not readily compatible with a progressive format. William F. Schreiber, who was director of the Advanced Television Research Program at the Massachusetts Institute of Technology from 1983 until his retirement in 1990, thought that the continued advocacy of interlaced equipment originated from consumer electronics companies that were trying to get back the substantial investments they made in the interlaced technology. Digital television transition started in late 2000s. All the governments across the world set the deadline for analog shutdown by 2010s. Initially the adoption rate was low. But soon, more and more households were converting to digital televisions. The transition is expected to be completed worldwide by mid to late 2010s. The advent of digital television allowed innovations like smart TVs. A smart television, sometimes referred to as connected TV or hybrid TV, is a television set or set-top box with integrated Internet and Web 2.0 features, and is an example of technological convergence between computers and television sets and set-top boxes. Besides the traditional functions of television sets and set-top boxes provided through traditional broadcasting media, these devices can also provide Internet TV, online interactive media, over-the-top content, as well as on-demand streaming media, and home networking access. These TVs come pre-loaded with an operating system. Smart TV should not to be confused with Internet TV, IPTV or with Web TV. Internet television refers to the receiving of television content over the internet instead of by traditional systems - terrestrial, cable and satellite (although internet itself is received by these methods). Internet Protocol television (IPTV) is one of the emerging Internet television technology standards for use by television broadcasters. Web television (WebTV) is a term used for programs created by a wide variety of companies and individuals for broadcast on Internet TV. Major TV manufacturers have announced production of smart TVs only, for middle-end and high-end TVs in 2015. Smart TVs are expected to become dominant form of television by late 2010s. Stereoscopic 3D television was demonstrated for the first time on 10 August 1928, by John Logie Baird in his company's premises at 133 Long Acre, London. Baird pioneered a variety of 3D television systems using electro-mechanical and cathode-ray tube techniques. The first 3D TV was produced in 1935. The advent of digital television in 2000s greatly improved 3D TVs. Although 3D TV sets are quite popular for watching 3D home media such as on Blu-ray discs, 3D programming has largely failed to make inroads with the public. Many 3D television channels which started in early 2010s were shut down by the mid 2010s. WRGB claims to be the world's oldest television station, tracing its roots to an experimental station founded on 13 January 1928, broadcasting from the General Electric factory in Schenectady, NY, under the call letters W2XB. It was popularly known as "WGY Television" after its sister radio station. Later in 1928, General Electric started a second facility, this one in New York City, which had the call letters W2XBS and which today is known as WNBC. The two stations were experimental in nature and had no regular programming, as receivers were operated by engineers within the company. The image of a Felix the Cat doll rotating on a turntable was broadcast for 2 hours every day for several years as new technology was being tested by the engineers. On 2 November 1936, the BBC began transmitting the world's first public regular high-definition service from the Victorian Alexandra Palace in north London. It therefore claims to be the birthplace of TV broadcasting as we know it today. With the widespread adoption of cable across the United States in the 1970s and 80s, terrestrial television broadcasts have been in decline; in 2013 it was estimated that about 7% of US households used an antenna. A slight increase in use began around 2010 due to switchover to digital terrestrial television broadcasts, which offered pristine image quality over very large areas, and offered an alternate to CATV for cord cutters. All other countries around the world are also in the process of either shutting down analog terrestrial television or switching over to digital terrestrial television. Earlier cable television was analog, but since 2000s all cable operators have switched to, or are in process of switching to, digital cable television. The direct-broadcast satellite television signals were earlier analog signals and later digital signals, both of which require a compatible receiver. Digital signals may include high-definition television (HDTV). Some transmissions and channels are free-to-air or free-to-view, while many other channels are pay television requiring a subscription. In 1945, British science fiction writer Arthur C. Clarke proposed a world-wide communications system which would function by means of three satellites equally spaced apart in earth orbit. This was published in the October 1945 issue of the Wireless World magazine and won him the Franklin Institute's Stuart Ballantine Medal in 1963. Internet television (Internet TV) (or online television) is the digital distribution of television content via the Internet as opposed to traditional systems like terrestrial, cable and satellite, although internet itself is received by terrestrial, cable or satellite methods. Internet television is a general term that covers the delivery of television shows and other video content over the Internet by video streaming technology, typically by major traditional television broadcasters. Internet television should not to be confused with Smart TV, IPTV or with Web TV. Smart television refers to the TV set which has an inbuilt operating system. Internet Protocol television (IPTV) is one of the emerging Internet television technology standards for use by television broadcasters. Web television is a term used for programs created by a wide variety of companies and individuals for broadcast on Internet TV. A television set, also called a television receiver, television, TV set, TV, or telly, is a device that combines a tuner, display, and speakers for the purpose of viewing television. Introduced in late 1920's in mechanical form, television sets became a popular consumer product after World War II in electronic form, using cathode ray tubes. The addition of color to broadcast television after 1953 further increased the popularity of television sets and an outdoor antenna became a common feature of suburban homes. The ubiquitous television set became the display device for the recorded media in the 1970s, such as VHS and later DVDs and Blu-ray Discs. Major TV manufacturers announced the discontinuation of CRT, DLP, plasma and even fluorescent-backlit LCDs by mid 2010s. Televisions since 2010s mostly use LEDs. LEDs are expected to be gradually replaced by OLEDs in near future. LCDs also have disadvantages. Other technologies address these weaknesses, including OLEDs, FED and SED, but as of 2014[update] none of these have entered widespread production. Broadcast syndication: this is the terminology rather broadly used to describe secondary programming usages (beyond original run). It includes secondary runs in the country of first issue but also international usage which may not be managed by the originating producer. In many cases, other companies, TV stations, or individuals are engaged to do the syndication work, in other words, to sell the product into the markets they are allowed to sell into by contract from the copyright holders, in most cases the producers. First-run programming is increasing on subscription services outside the US, but few domestically produced programs are syndicated on domestic free-to-air (FTA) elsewhere. This practice is increasing however, generally on digital-only FTA channels or with subscriber-only first-run material appearing on FTA. Unlike the US, repeat FTA screenings of an FTA network program usually only occur on that network. Also, affiliates rarely buy or produce non-network programming that is not centered on local programming. The least expensive forms of entertainment programming genres are game shows, talk shows, variety shows, and reality television. Game shows feature contestants answering questions and solving puzzles to win prizes. Talk shows contain interviews with film, television, and music celebrities and public figures. Variety shows feature a range of musical performers and other entertainers, such as comedians and magicians, introduced by a host or Master of Ceremonies. There is some crossover between some talk shows and variety shows because leading talk shows often feature performances by bands, singers, comedians, and other performers in between the interview segments. Reality TV shows "regular" people (i.e., not actors) facing unusual challenges or experiences ranging from arrest by police officers (COPS) to weight loss (The Biggest Loser). A variant version of reality shows depicts celebrities doing mundane activities such as going about their everyday life (The Osbournes, Snoop Dogg's Father Hood) or doing manual labor (The Simple Life). Fictional television programs that some television scholars and broadcasting advocacy groups argue are "quality television" include series such as Twin Peaks and The Sopranos. Kristin Thompson argues that some of these television series exhibit traits also found in art films, such as psychological realism, narrative complexity, and ambiguous plotlines. Nonfiction television programs that some television scholars and broadcasting advocacy groups argue are "quality television" include a range of serious, noncommercial programming aimed at a niche audience, such as documentaries and public affairs shows. Around the globe, broadcast TV is financed by government, advertising, licensing (a form of tax), subscription, or any combination of these. To protect revenues, subscription TV channels are usually encrypted to ensure that only subscribers receive the decryption codes to see the signal. Unencrypted channels are known as free to air or FTA. In 2009, the global TV market represented 1,217.2 million TV households with at least one TV and total revenues of 268.9 billion EUR (declining 1.2% compared to 2008). North America had the biggest TV revenue market share with 39% followed by Europe (31%), Asia-Pacific (21%), Latin America (8%), and Africa and the Middle East (2%). Globally, the different TV revenue sources divide into 45%-50% TV advertising revenues, 40%-45% subscription fees and 10% public funding. In many countries, including the United States, television campaign advertisements are considered indispensable for a political campaign. In other countries, such as France, political advertising on television is heavily restricted, while some countries, such as Norway, completely ban political advertisements. The first official, paid television advertisement was broadcast in the United States on July 1, 1941 over New York station WNBT (now WNBC) before a baseball game between the Brooklyn Dodgers and Philadelphia Phillies. The announcement for Bulova watches, for which the company paid anywhere from $4.00 to $9.00 (reports vary), displayed a WNBT test pattern modified to look like a clock with the hands showing the time. The Bulova logo, with the phrase "Bulova Watch Time", was shown in the lower right-hand quadrant of the test pattern while the second hand swept around the dial for one minute. The first TV ad broadcast in the UK was on ITV on 22 September 1955, advertising Gibbs SR toothpaste. The first TV ad broadcast in Asia was on Nippon Television in Tokyo on August 28, 1953, advertising Seikosha (now Seiko), which also displayed a clock with the current time. US advertising rates are determined primarily by Nielsen ratings. The time of the day and popularity of the channel determine how much a TV commercial can cost. For example, it can cost approximately $750,000 for a 30-second block of commercial time during the highly popular American Idol, while the same amount of time for the Super Bowl can cost several million dollars. Conversely, lesser-viewed time slots, such as early mornings and weekday afternoons, are often sold in bulk to producers of infomercials at far lower rates. The TV regulator oversees TV advertising in the United Kingdom. Its restrictions have applied since the early days of commercially funded TV. Despite this, an early TV mogul, Roy Thomson, likened the broadcasting licence as being a "licence to print money". Restrictions mean that the big three national commercial TV channels: ITV, Channel 4, and Channel 5 can show an average of only seven minutes of advertising per hour (eight minutes in the peak period). Other broadcasters must average no more than nine minutes (twelve in the peak). This means that many imported TV shows from the US have unnatural pauses where the UK company does not utilize the narrative breaks intended for more frequent US advertising. Advertisements must not be inserted in the course of certain specific proscribed types of programs which last less than half an hour in scheduled duration; this list includes any news or current affairs programs, documentaries, and programs for children; additionally, advertisements may not be carried in a program designed and broadcast for reception in schools or in any religious broadcasting service or other devotional program or during a formal Royal ceremony or occasion. There also must be clear demarcations in time between the programs and the advertisements. The BBC, being strictly non-commercial, is not allowed to show advertisements on television in the UK, although it has many advertising-funded channels abroad. The majority of its budget comes from television license fees (see below) and broadcast syndication, the sale of content to other broadcasters. The Broadcasting Commission of Ireland (BCI) (Irish: Coimisiún Craolacháin na hÉireann) oversees advertising on television and radio within Ireland for both private and state-owned broadcasters. There are some restrictions based on advertising, especially in relation to the advertising of alcohol. Such advertisements are prohibited until after 7 pm. Broadcasters in Ireland adhere to broadcasting legislation implemented by the Broadcasting Commission of Ireland and the European Union. Sponsorship of current affairs programming is prohibited at all times. As of 1 October 2009, the responsibilities held by the BCI are gradually being transferred to the Broadcasting Authority of Ireland. The two main BBC TV channels are watched by almost 90% of the population each week and overall have 27% share of total viewing, despite the fact that 85% of homes are multichannel, with 42% of these having access to 200 free to air channels via satellite and another 43% having access to 30 or more channels via Freeview. The licence that funds the seven advertising-free BBC TV channels currently costs £139.50 a year (about US$215) regardless of the number of TV sets owned. When the same sporting event has been presented on both BBC and commercial channels, the BBC always attracts the lion's share of the audience, indicating that viewers prefer to watch TV uninterrupted by advertising. Other than internal promotional material, the Australian Broadcasting Corporation (ABC) carries no advertising; it is banned under the ABC Act 1983. The ABC receives its funding from the Australian government every three years. In the 2008/09 federal budget, the ABC received A$1.13 billion. The funds provide for the ABC's television, radio, online, and international outputs. The ABC also receives funds from its many ABC shops across Australia. Although funded by the Australian government, the editorial independence of the ABC is ensured through law. In Japan, NHK is paid for by license fees (known in Japanese as reception fee (受信料, Jushinryō?)). The broadcast law that governs NHK's funding stipulates that any television equipped to receive NHK is required to pay. The fee is standardized, with discounts for office workers and students who commute, as well a general discount for residents of Okinawa prefecture. Television has played a pivotal role in the socialization of the 20th and 21st centuries. There are many aspects of television that can be addressed, including negative issues such as media violence. Current research is discovering that individuals suffering from social isolation can employ television to create what is termed a parasocial or faux relationship with characters from their favorite television shows and movies as a way of deflecting feelings of loneliness and social deprivation. Several studies have found that educational television has many advantages. The Media Awareness Network, explains in its article "The Good Things about Television" that television can be a very powerful and effective learning tool for children if used wisely. ↑ "Télévision au moyen de l'électricité", "Congrès Inographs by Telegraph"], The New York Times, Sunday Magazine, 20 September 1907, p. 7. ↑ "Sending Photographs by Telegraph", The New York Times, Sunday Magazine, 20 September 1907, p. 7. ↑ Henry de Varigny, "La vision à distance", L'Illustration, Paris, 11 December 1909, p. 451. ↑ "Current Topics and Events", Nature, vol. 115, 4 April 1925, p. 505–506, doi:10.1038/115504a0. ↑ "Radio Shows Far Away Objects in Motion", The New York Times, 14 June 1925, p. 1. ↑ 22.0 22.1 Kenjiro Takayanagi: The Father of Japanese Television, NHK (Japan Broadcasting Corporation), 2002, retrieved 2009-05-23. ↑ "Distant Electric Vision", The Times (London), 15 Nov. 1911, p. 24b. ↑ United States Patent Office, Patent No. 2,133,123, 11 Oct 1938. ↑ 44.0 44.1  "Kálmán Tihanyi (1897–1947)", IEC Techline, International Electrotechnical Commission (IEC), 2009-07-15. ↑ 45.0 45.1 "Kálmán Tihanyi's 1926 Patent Application 'Radioskop'", Memory of the World, United Nations Educational, Scientific and Cultural Organization (UNESCO), 2005, retrieved 2009-01-29. ↑ 51.0 51.1 "Philo Taylor Farnsworth (1906–1971)", The Virtual Museum of the City of San Francisco, retrieved 2009-07-15. ↑ Everson, George (1949), The Story of Television, The Life of Philo T. Farnsworth New York, NY: W. W. Norton & Co,. ISBN 978-0-405-06042-7, pages 137–141. ↑ Everson, George (1949), The Story of Television, The Life of Philo T. Farnsworth New York, NY: W. W. Norton & Co,. ISBN 978-0-405-06042-7, page 139. ↑ Everson, George (1949), The Story of Television, The Life of Philo T. Farnsworth New York, NY: W. W. Norton & Co,. ISBN 978-0-405-06042-7, page 141. ↑ Everson, George (1949), The Story of Television, The Life of Philo T. Farnsworth New York, NY: W. W. Norton & Co,. ISBN 978-0-405-06042-7, page 248. ↑ 89.0 89.1 Abramson, Albert (1987), The History of Television, 1880 to 1941. Jefferson, NC: Albert Abramson. p. 254. ISBN 0-89950-284-9. ↑ "Go-Ahead Signal Due for Television", The New York Times, 25 April 1941, p. 7. ↑ "An Auspicious Beginning", The New York Times, 3 August 1941, p. X10. ↑ "On the beginning of broadcast in 625 lines 60 years ago", 625 magazine (in Russian). ↑ M. Le Blanc, "Etude sur la transmission électrique des impressions lumineuses", La Lumière Electrique, vol. 11, 1 December 1880, p. 477–481. ↑ Peter C. Goldmark, assignor to Columbia Broadcasting System, "Color Television", U.S. Patent 2,480,571, filed 7 Sept. 1940. ↑ "Color Television Success in Test", The New York Times, 30 August 1940, p. 21. ↑ "Color Television Achieves Realism", The New York Times, 5 Sept. 1940, p. 18. ↑ "Color Television Success in Test," New York Times, 30 Aug. 1940, p. 21. "CBS Demonstrates Full Color Television," Wall Street Journal, 5 Sept. 1940, p. 1. "Television Hearing Set," New York Times, 13 Nov. 1940, p. 26. ↑ "Making of Radios and Phonographs to End April 22," New York Times, 8 March 1942, p. 1. "Radio Production Curbs Cover All Combinations," Wall Street Journal, 3 June 1942, p. 4. "WPB Cancels 210 Controls; Radios, Trucks in Full Output," New York Times, 21 August 1945, p. 1. ↑ Karen Hornick "That Was the Year That Was" American Heritage, Oct. 2006. ↑ Jon Stewart of "The Daily Show" was mock-outraged at this, saying, "That's what we do! ", and calling it a new form of television, "infoganda". ↑ Media Awareness Network, "The Good Things About Television"
This page was last modified on 23 February 2017, at 11:37.